Very low fat and high in fiber. Combine black beans and corn. Mix all ingredients and chill overnight. Note: try adding avocado or barbecued fresh corn instead of canned corn. A different "cold salad". A fresh and yummy addition for summer picnics, or a meal. Homemade and sugar-free made with coconut flour. Quinoa with tomatoes, cucumber, cilantro, olive oil and vinegar. 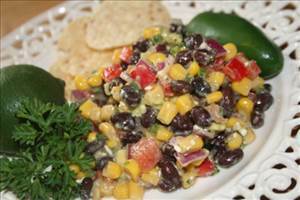 There are 125 calories in 1 serving of Black Bean & Corn Salad. Calorie Breakdown: 10% fat, 72% carbs, 18% prot.